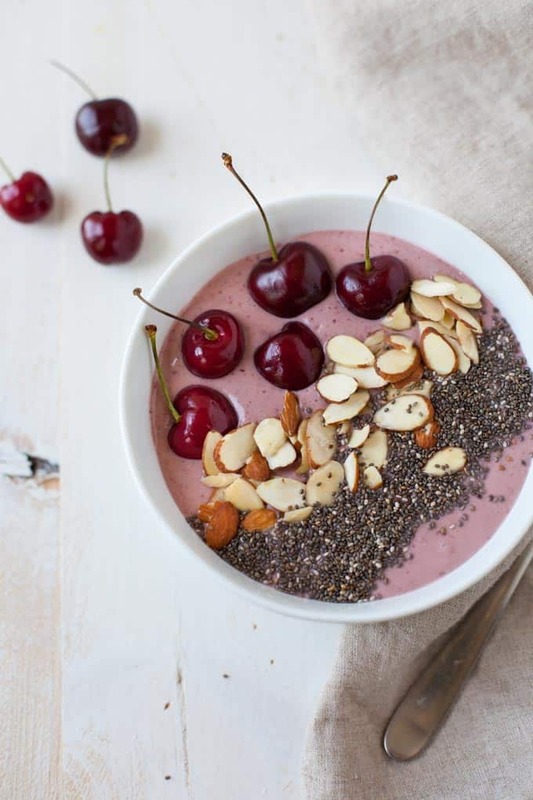 This cherry cheesecake smoothie bowl may taste indulgent but it’s a protein-packed and healthy way to start your morning. Hi, friends! I’m almost one week into my Switzerland trip and I can’t wait to share my travels with you when I return home! But for now I have a delicious breakfast recipe that’s going to sweeten your morning routine. You guys know I have a thing for dessert breakfasts, right? I mean there’s been the Wild Blueberry Basil Cheesecake Smoothie, Strawberry Rhubarb Pie Smoothie, Chocolate Cherry Frosty, Carrot Cake Overnight Oats and Apple Pie Teff Porridge. I guess it’s no secret that I have a serious sweet tooth. But have no fear because you can easily make delicious, indulgent tasting breakfasts super healthy and good-for-you too. And that’s the case for the newest addition to my DFB (dessert for breakfast) collection: Cherry Cheesecake Smoothie Bowl. Smoothies are such an easy breakfast to make in the morning. 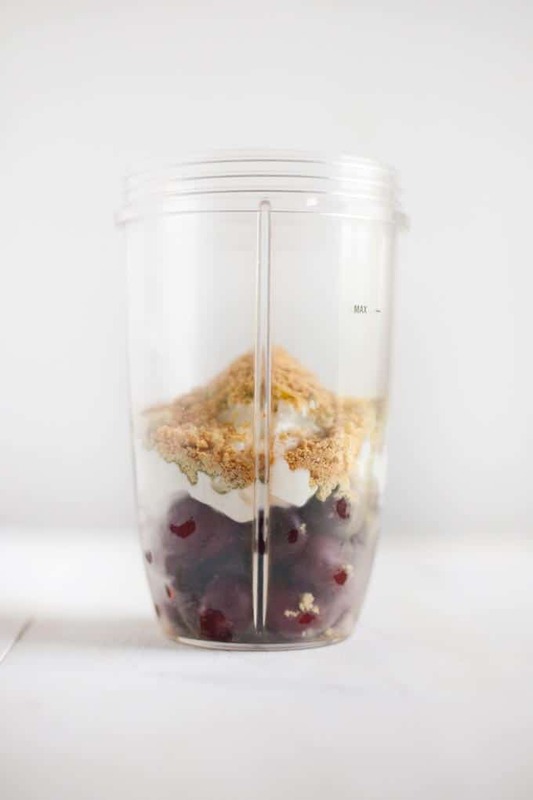 Throw your ingredients into a blender and 60 seconds later, breakfast is served. But I think that smoothie bowls are even more satisfying for breakfast. Slightly thicker than regular smoothies, smoothie bowl smoothies are meant to be eaten out of a bowl with a spoon. Not only does their thicker consistency make them more satisfying but the toppings add more staying power as well. Top ’em off with nuts, more fruit, seeds, granola, etc. for some added fiber and/or protein. 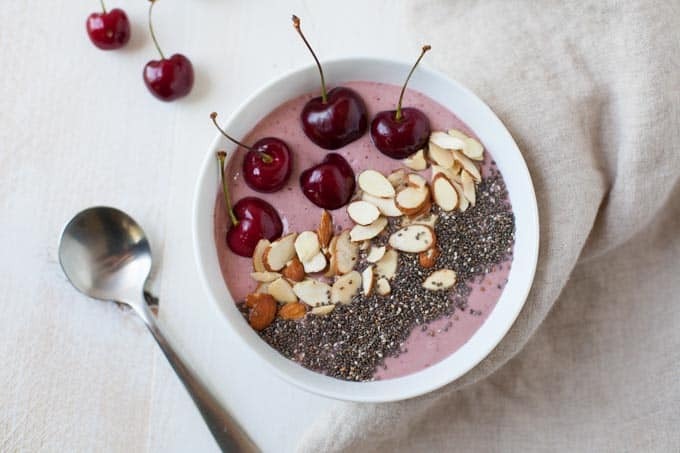 This cherry cheesecake smoothie bowl was inspired by my favorite dessert growing up. I was the kid who had to have two cakes on her birthday. One cherry cheesecake for me. And one normal cake for everyone else who would attend my birthday party. Spoiled? Perhaps. A girl who knew she loved cheesecake and no other? Definitely. 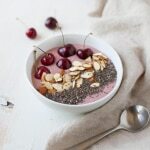 This smoothie bowl has the sweet taste of cherry cheesecake thanks to the frozen dark sweet cherries, the creamy texture thanks to the cottage cheese and protein powder and that classic crust taste thanks to the graham cracker crumbs. Even though this smoothie bowl tastes indulgent, you can definitely indulge in this for breakfast sans guilt. This bowl has no added sugar and is protein-loaded with the cottage cheese and vanilla protein powder. Plus the almonds and chia seed toppings give the bowl that extra burst of fiber to help hold you over until lunch. And be sure to savor the taste of this bowl as you start your day off right. DYK that people who savor their food and let the pleasant experience settle into their minds and bodies are in general happier than those who don’t let positive experiences sink in? 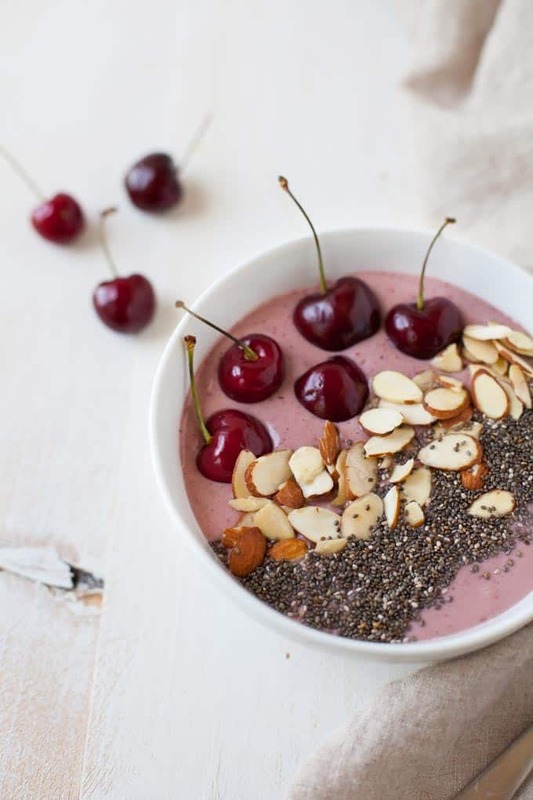 So get happy and indulge mindfully in this smoothie bowl! Blend all ingredients until smooth and creamy. Pour into a bowl and add desired toppings. Tell me, are you a DFB (dessert for breakfast) fan? What’s your favorite dessert smoothie? Oh, yes!!! My kind of breakfast! I seriously love the idea of using cherries in smoothies. I am so trying that next time I get a smoothie craving!